Summer is officially here, and with it, all the fun outdoor events. Unfortunately, you cannot wear your swimsuits and flip flops every day. There are times that you need to look polished and professional, or chic and polished for that big event. Whether you have been working hard to have that swimsuit body, or you need to adjust a few items in your closet for a better fit, you know you can save money by having your items professionally altered. The next decision you must make is where to take your clothes, particularly those expensive, designer-label items, to ensure the alterations are done correctly. Wouldn’t it be nice if you could just take them somewhere you already go, like your dry cleaners? Do they have professionals on staff? Are they capable of taking care of your expensive items? Do they provide full alterations or just an occasional button or hem? At Bibbentuckers, we have full-service alterations performed by our in-house professional alterations team. Our team handles more than buttons and hems. You can have your clothes altered and either pressed or cleaned and ready to go, all in one quick stop. So, as you are sorting through your closet deciding what pieces you want to wear this summer, remember that you can come to us, your professional dry cleaners, and have your items altered by one of our remarkable alterations team. Don’t need alterations? We also provide a press-only service that will have you in your summer clothes looking crisp, clean and ready to go. 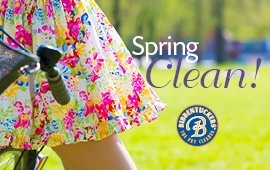 Bibbentuckers provides both full-service dry cleaning and professional alterations. Our team receives thorough training to learn how to clean and alter your designer label items as well as to understand the nuances of cleaning, pressing and altering your best clothes. To learn more, please visit our website at www.Bibbentuckers.com.